This is Terry, the coolest guy never published. He's the brainchild of my pal Cullen and the first idea CB told me about when we met. Someday (fingers crossed) Terry a.k.a. Freakhunter will hit it big in the funnybooks, until then he'll be popping up on my blog from time to time since he's part of one of the most original concepts ever. Oh yeah. this is brush pen and Microns, if you're interested. Hey, man! It's good to see ol' Terry again! Totally! 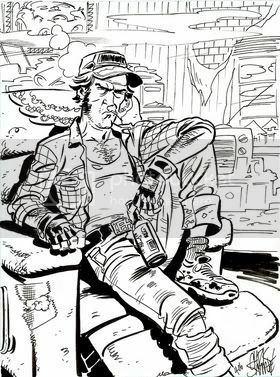 But if I ever miss Freakhunter all I have to do is pop in a Billy Bob Thornton movie and and there he is looking right back at me the same way he looks at me from the comic page...and it makes me feel a little wierd. Very nice! I hope you guys get this sucker published. Cullen let me read a bit of one of the scripts and I thought it was a cool concept.